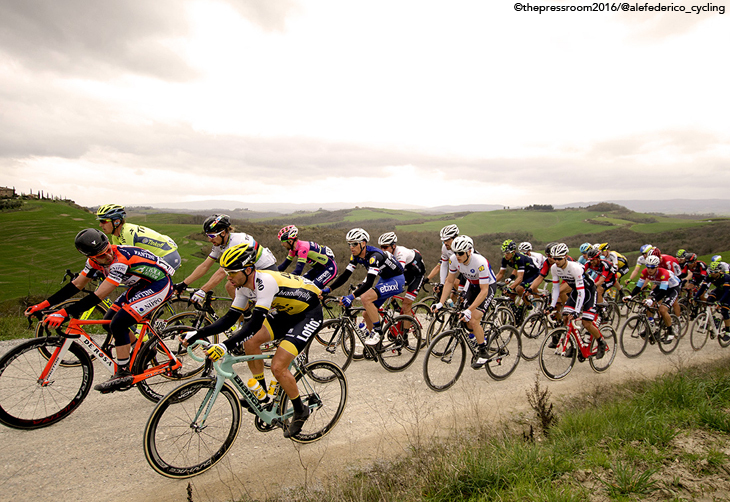 Our man in Italy, Alessandro Federico, gives us the lowdown on this year's Strade Bianche! On a day when World Champions and former winners came to the fore it was the two-time victor Fabian Cancellara who proved the strongest on the day…and won himself a named sector of this race through the beautiful Tuscan countryside. A strong and clever ride saw him win out in the end over the Etixx-Quickstep pairing of Zdenek Stybar and Gianluca Brambilla with Peter Sagan paying for his efforts on the final run-in. Curse of the World’s Stripes? Die-hard fans of our sport will remember the much-cited ‘curse of the World’s jersey’ where off-season dinners and ‘meet-and-greets’ took a toll on a champion’s ability to be race-fit come the following year. Younger fans though have never really been exposed to this and our current road champions have put the theory to bed. In a thrilling finish to the women’s race Britain’s Lizzie Armitstead took yet another victory to see her season more than justified already…and she’s only just started. Could her male counterpart Peter Sagan do likewise? 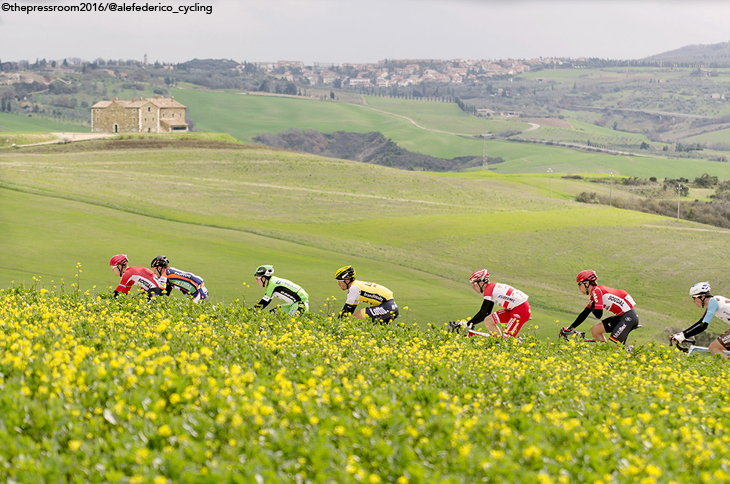 As the riders rolled out from the historic city of Siena it was under leaden skies with a drizzly rain just beginning. Riders from the northern classics would be very much at home even if the mud was bound to be a different color. One racer missing from the start was Orica’s Adam Yates. The first group to go clear consisted of eight riders: Jesse Sergeant (AG2R-La Mondiale), Riccardo Stacchiotti (Nippo Vini Fantini), Marcin Mrozek (CCC Sprandi Polkowice), Tom Van Asbroeck (LottoNL-Jumbo), the Lotto Soudal pairing of Jens Debuscherre and Pim Ligthart, Lorenzo Rota (Bardiani-CSF) and Tiziano Dall’Antonia (Androni). With the riders from lower level teams keen to get some television exposure they gained a lead of some three minutes. Eventually though, Etixx-Quickstep began to up the pace and this had the effect of splitting the main peloton into three distinct groups. With the gap coming down the main group of about 50 riders came through the feedzone and there was the inevitable slowing as riders made sure to take on enough supplies to see them through the second half of the race. The gap to the leaders went out again but once the group had settled down the leaders were caught in short order. Onto the fifth sector and there was movement off the front as Gianluca Brambilla (Etixx-QS), Andriy Grivko (Astana), Pim Ligthart again, Salvatore Puccio (Team Sky) and Brent Bookwalter (BMC) went clear. With Grivko bouncing on and off the back of the leaders their advantage was only 30 seconds as more and more riders were falling away from the chasing group. Bad news for Puccio as he had a chain issue and was forced to pull over. With the main group down to 30 riders the second bunch was trying to organize an effort to get across but the lead group could smell victory. Lars Peter Nordhaug (Team Sky) attempted to get across to the break but ended up sitting in no-man’s land before being reeled in by the lead group. The leaders had a gap of 1:08 but this was gradually coming down as the chasers could see them on the long straight sections. With Puccio’s bad luck Sky had put a man on the front of the group and were chasing with Movistar in an attempt to salvage something from this race. The lead riders however were working well together and the gap was hovering around 40 seconds with 25km to run. Onto the seventh sector and Brambilla, who had been very active at the front forcing the pace, eventually pulled Brent Bookwalter clear of Grivko and Monfort. The former World Champion Michal Kwiatkowski (Team Sky) injected a huge effort on the front of the bunch in an attempt to close the gap. Sensing this, Brambilla dropped Bookwalter as he attempted to evade the efforts of his former teammate. Kwiatkowski’s effort was so huge that it split the group and around 10-15 riders were left struggling to catch the wheels. 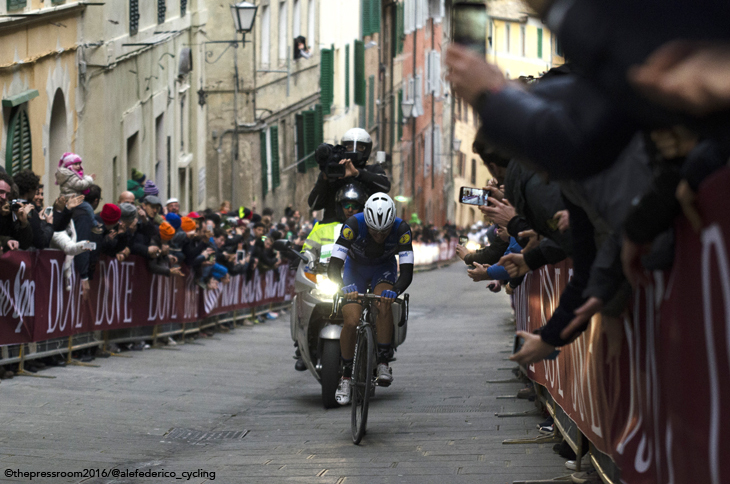 'most aggressive rider' must go to Gianluca Brambilla! Onto the eight sector…and it was 20kms and 20 seconds for Brambilla as he attempted to solo to the finish. Could he hold off the challenge from the chasers or would he be caught? And suddenly there was Sagan (Tinkoff-Saxo)! He oh-so-quickly reeled in the Etixx rider but they also had a Plan B. With him was last year’s winner Stybar (Etixx-QS) and Fabian Cancellara (Trek-Segafredo) quickly saw the danger and bridged across. If Cancellara could win for a third time he would get a sector named after him. With Nibali (Astana) and Van Avermaet (BMC) caught up in the groups behind this lead quartet had a gap of 15 seconds. Into the final 12km and the chasers were desperately trying to reel in the escapees with Nibali himself doing massive turns on the front. The four leaders were looking comfortable now especially as they’d just hit the final sector of strade and at only 1.1km in length they knew they didn’t have too much longer to run. The gap wasn’t great at 13 seconds but with Sagan and Cancellara making the running it might just be enough. Behind, Nibali was now paying for his efforts and had to watch Greg Van Avermaet tear off into the distance as he attempted to get back on terms with the leaders. With another of the short, sharp climbs taken by Cancellara and Sagan at the head as usual, the distance between the chasers and the front of the race looked so slender, especially from the helicopter. Now it was a desperate struggle for both groups as they sped past ancient-looking villas and down twisting roads only 8km from the finish in the Piazza del Campo. With two riders upfront the advantage was obviously with the Belgian squad and the first attack came from Brambilla with 7.7km to run. Sagan and Cancellara continued to push and it was the Trek rider who eventually closed down the attack. Downhill, and into tuck positions as they headed into Siena, and they were all back together only to see the Italian attack once again as the road leveled out. Possibly, not the best use of their upperhand but Stybar knows how to finish a race off by himself. Into the twisting streets and Brambilla almost overcooked it on a tight right-hander. The ‘bunch’ behind had not given up and were still chasing but time for them was fast running out. The Italian only had a few seconds in hand but with the steep sections at the finish the other three didn’t look too worried and were more intent on each other and the chasers behind. Brambilla was under the flag with 8 seconds to spare over the others but the climb was hurting as Sagan, Stybar and Cancellara wound him in. Over the crest on his own…but only just as the crowd drove him on. Cancellara and Stybar were onto him as Sagan dropped off and for a moment it was three riders. But really it was all about Cancellara as he and Stybar left Brambilla to take third spot. The Swiss rider had exactly the right position and held it through the final tight turns and as the two riders sped down the final little slope he was never challenged for the win by last year’s victor who had settled for second spot. Cancellara now has his third win and will get that named sector…a fitting prize for a worthy winner and he was ecstatic at the finish. Stybar took second to add to his win last year. Brambilla, with all his attacks, could only take third and the World Champion Sagan had to settle for fourth today. With Armitstead taking her second win in two weeks and with Sagan just off the podium in the men’s race, the future of the UCI World’s jersey looks secure for another year…and the curse has finally been put to rest.